With a little help from technology, a young filmmaker, musician, writer, or artist can pursue their work like a pro. If a writer wanted to write a book, he had to get the attention — and the financial support — of an established publisher. If a guitar player wanted to record and distribute her music, she had to get the backing of a music producer. If a painter wanted to sell his art, he had to find a gallery to show it. If a filmmaker wanted to see her film come to life, she needed expensive equipment — and a movie studio — to produce and distribute it to the world. But that’s all changed now. All of it. Because now, technology can enable the most ordinary person to do truly extraordinary things. 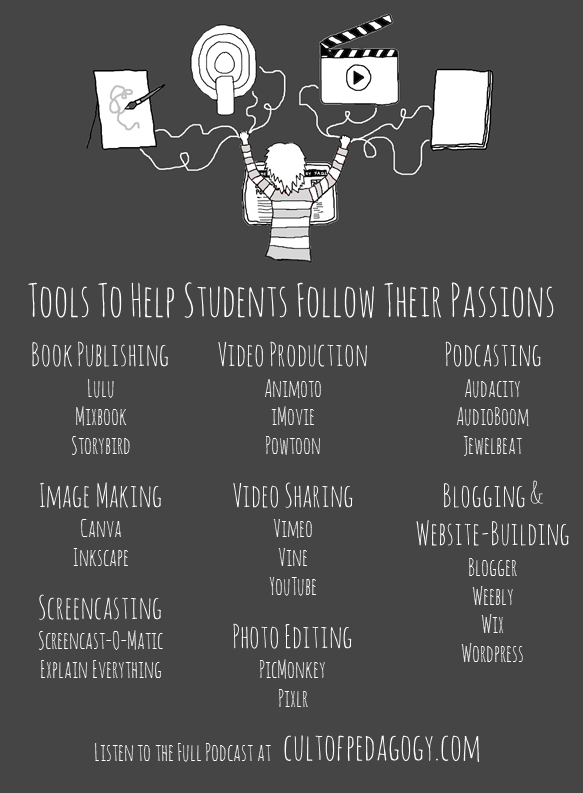 Specifically, a group of resources I’m calling Passion Tools, different types of tech tools that help students (or anyone, really) take their personal interests or talents to a whole new level, developing and sharing them in the same way a professional would: book publishing tools, blogging and website-building tools, image-making tools, screencasting and podcasting tools (and I explain what both of these are! ), photo editing tools, and tools that help you create and share videos. The game really is so different now, and anyone with the tools can play. Consider this a starter kit. Join my mailing list and get weekly tips, tools, and inspiration — in quick, bite-sized packages — all geared toward making your teaching more effective and joyful. To thank you, I’ll send you a free copy of my new e-booklet, 20 Ways to Cut Your Grading Time in Half. I look forward to getting to know you better! What’s so great about Google Drive? And why should my students be using it? I have just been given one more suggested addition to this list: Thrively, a site that provides parents and teachers with tools to help kids assess their strengths, then match them with activities, camps, and apps. Looks fantastic! Show me is a great free tool. Portaportal is great for keeping all your great sites along with the portaporals of other teachers. It is a portable bookmarking site that is free. The literacy Shed, The Math Shed are both really interesting sites. Live Binders is a great source of information. I teach life skills in a Community Based Instruction Classroom in a small town in Arkansas. I am always looking for places to enhance my students learning. Thanks for sharing these, April! Wow, amazing list! I use Pixlr and Canva regularly and Explain Everything is great for awesome presentations. Besides, you helped me to discover some new tools for video production. I will definitely share this article with my students. Thank you, Jennifer, for a truly useful tool. I’m a 30 year art teacher with a few decades in graphic design and art textbook writing, and I’ve been trying to perfect a lesson on digital usage for 2 years. This post will provide the meat of my new lesson!